I’m actually a big fan of using balloons as stress balls. I like having a stress ball I can destroy in the end. But if you’re less destructive than I am, this cool post will give you step by step instructions to make your own homemade (or officemade) stress ball. And if you think this is just a silly little timewaster, consider the fact that stress balls have actual, tangible health benefits. 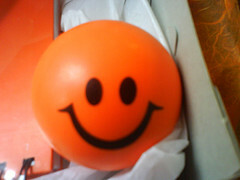 Stress balls have been used for years for a wide range of medicinal reasons. Stress balls were used in ancient civilizations to relieve stress, improve coordination, prevent arthritis and rheumatism, stimulate blood circulation, help during physical therapy and assist with meditation. Stress balls may also help in the prevention or treatment of carpal-tunnel syndrome.